:: Oh Say Can You See? magnus, originally uploaded by alister. 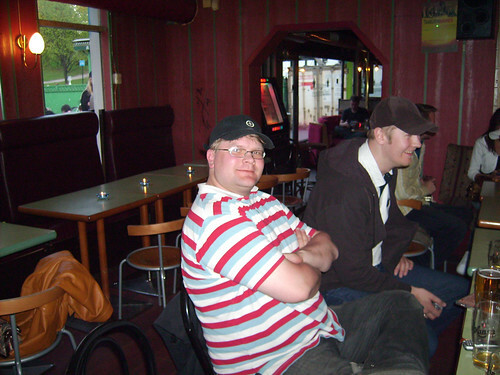 Magnus, the great helmsman and stationmaster on the occasion of his 30th birthday, in a shady bar in an unfashionable quarter of Oslo. That was a great night out! The band that started playing wasn't so good though. I'd love to come over one day, for cheaper pints and deep fried mars bars. Yeah, a good night. I'm sure you would have a good time in Edinburgh too. Thanks for showing me around! Hi Alister! Thnks for stopping by our congress and sorry for missing out on you on the great celebration of the stationmaster! I stopped by some time during the evening but you were all gone, and we also retreated because of the (yes, awful) band. Hope we will see you at the unification congress next time, although probably I won't be around (out shooting the wolf you know). Excuse me, mr Lars. What "unification congress"? This is a question currently up for debate all over Norway, and it will continue to be so for quite some time. I.e. - there might be such a congress. And then again, there might not.